Kuehne and Nagel are an international logistics company, they have a number of high profile clients, and were looking at ways they could strengthen their team to enable them to meet aggressive new business targets. 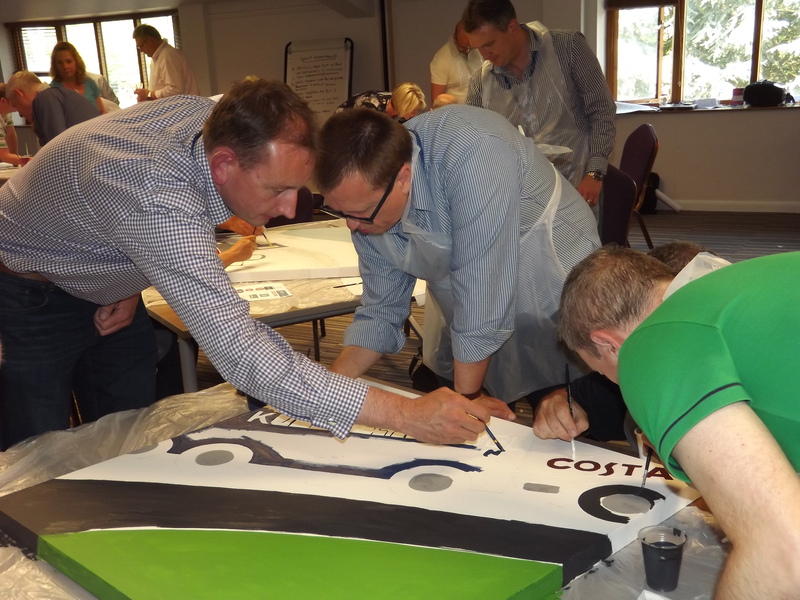 The Directors arranged three days of strategy and planning, for both the business development team and the directors of each area of the business, to develop a better understanding of roles and responsibilities and encourage team playing. 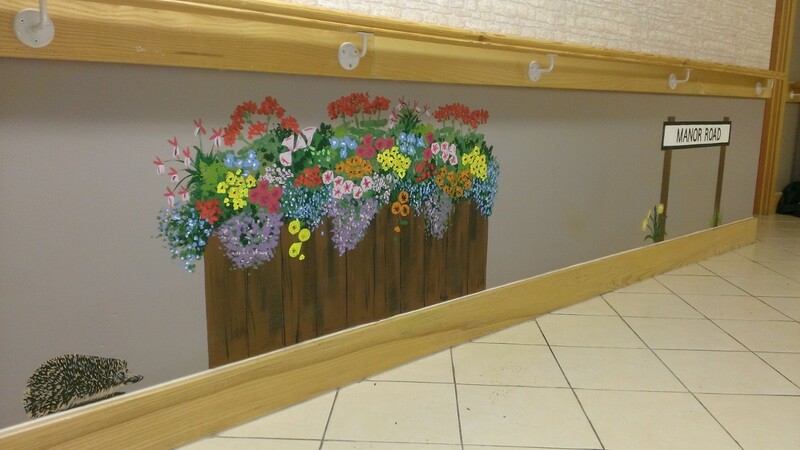 Charlotte Designs were approached to deliver a team building mural activity for the group, to consolidate the work done and ensure the provide a lasting visual reminder of the week. It was decided that the group would be divided into teams of four and work on large canvasses. 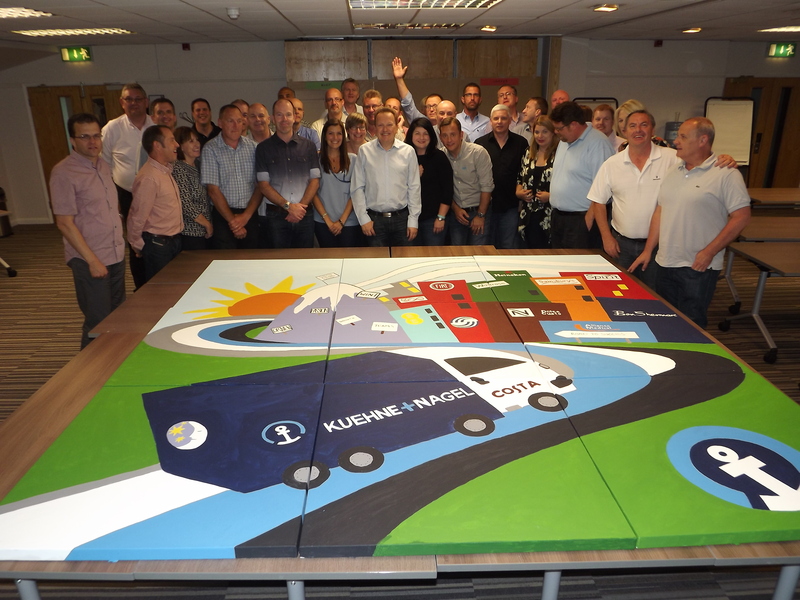 When the canvasses were hung together, they formed a mural of a Kuehne and Nagel lorry driving up a Swiss mountain, to a city that was occupied by their customers. 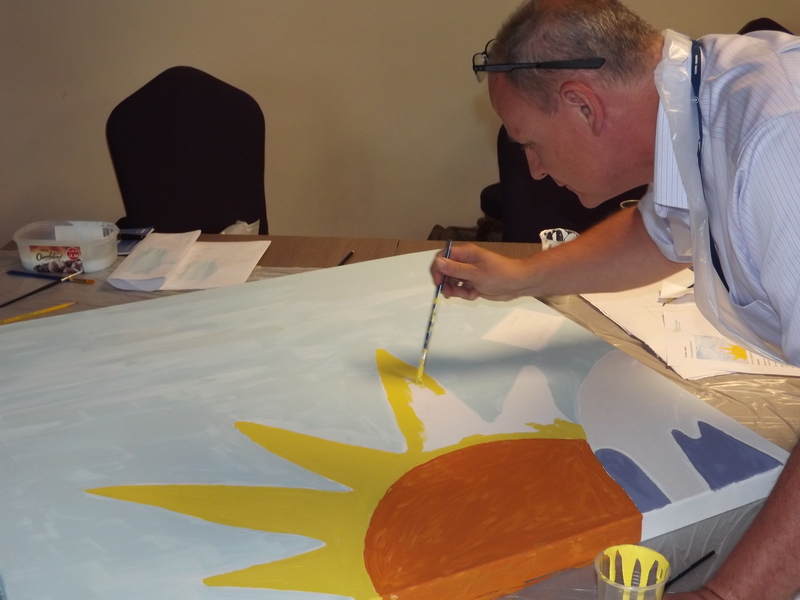 The teams not only had to work together to get the canvasses painted in tight timeframes, but they had to liaise with the teams around them to ensure continuity in the mural as a whole. Each team knew what their canvas should look like, but not what the mural as a whole would would be. They were also given a number of fun exercises at the beginning of the session to get them into a creative frame of mind. The end result was spectacular. “You have made us all look really talented.” one participant said. The mural now hangs proudly in the main stairwell of the UK headquarters and attracts a lot of attention. Each delegate also received a framed photograph of the finished mural to keep. 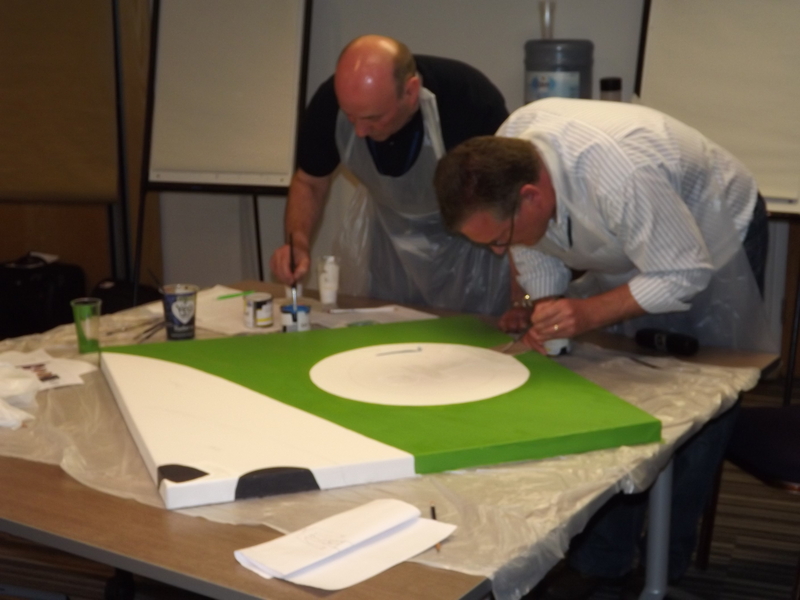 “The finished canvas looks brilliant …and a huge thank you for all the hard work you did – all the feedback I’ve had has been incredibly positive.” was the verdict of the Director who arranged the day. Camelot Primary School is a large school in south London that has been in special measures for a number of years. In September 2016, a new management team were appointed and given just 3 years to bring the school to an outstanding status. The physical building has a number of challenges and is, on the whole, a very depressing and uninspiring place. The new Head and his deputy, saw improvement of the environment as a priority. Charlotte Designs were approached to design both a mural and a mechanisim to include students. 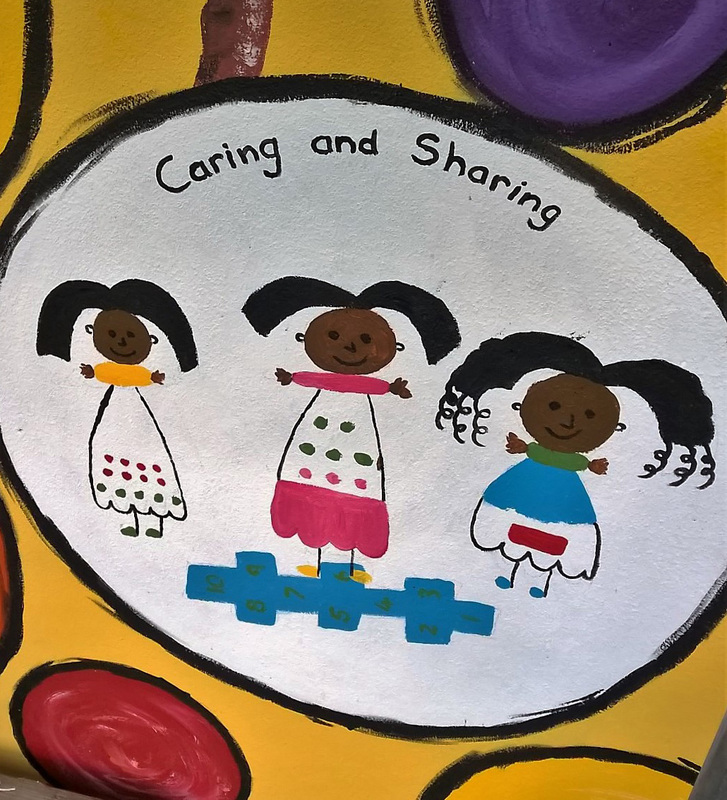 The size and height of the site in the playground prevented the children from physically painting, but In collaboration with the staff, a guided competition would be the best solution. There is a famous mural close to the school which features a bird in a tree and the school is in Bird in Bush road, so it was decided to use that as our inspiration. 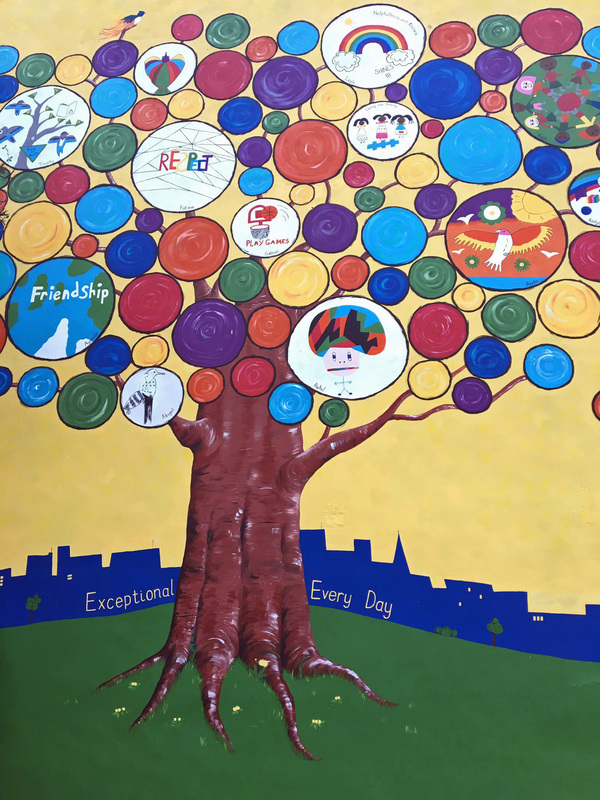 Our stylised tree was made up of circles , 12 of which had the winning designs from the students within. The rest of the mural was bright, colourful, included the school motto and of course had a bird perched in the top. Charlotte Designs designed and produced the competition handout as well as helped to pick the winners. The children watched eagerly as their designs appeared on the wall and their excitement was tangible. The end result was spectacular. “The difference you have made is immeasurable.” said deputy head Erika Eisele, “a huge thank you from all of us.” The school have already commissioned further work in the KS1 and Year 6 areas. In 2011, The Gallery in Milton Keynes embarked on a major rebranding exercise. The Gallery is one of the countries leading art galleries and attracts exhibitions from all over the world. The purpose built building had been painted pink for an Michael Craig Martin exhibition in 2004 and this had created a major talking point in a city filled with art installations. The Gallery wanted to explore the idea of transferring their branding onto the outside of the building, to once again, get the city talking. The branding was created by a studio in London and Charlotte Designs was approached to explore the possibility of transferring it to three facades of the building. The original branding had to be modified considerably to enable it to be painted onto the very rough surface of the gallery’s rendered walls. Charlotte Designs worked closely with the branding agency to ensure that integrity was maintained, whilst making the design suitable for application on such a difficult surface. Four squares were painted on two facades and three on one facade, with difference geometric patterns and ‘MK Gallery’ painted on all three facades and the front fin. The work was completed by Charlotte Designs over 2 weeks in the summer of 2011 and was finished on time for the Gallery reopening. The mural was well received at the opening and continues to be a focal point for the Central Milton Keynes area. It is used as a backdrop by photographers and artists on a regular basis. “We are grateful to Sarah for her hard work in getting the mural to achieve it’s objective.” said a gallery spokesman. The gallery is undergoing a major expansion due to be completed in Spring 2019. 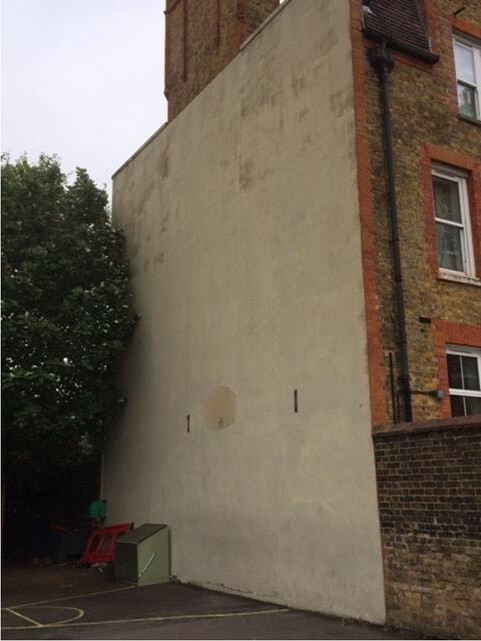 Charlotte Designs have been approached again to paint a new mural onto the outside of the gallery. 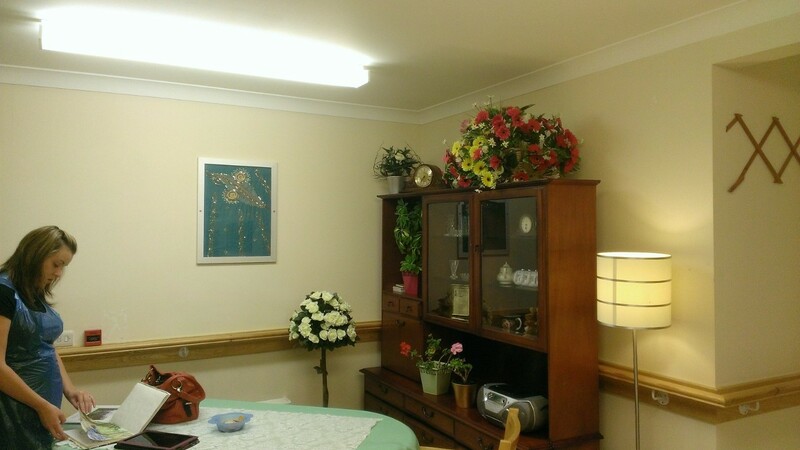 Dovecote Manor is a 40 bedroom care home with a specialist dementia unit. The home had recently been redecorated, and many areas and been given ‘faux brick’ wallpaper and large ‘front door’ stickers to give a street appearance. 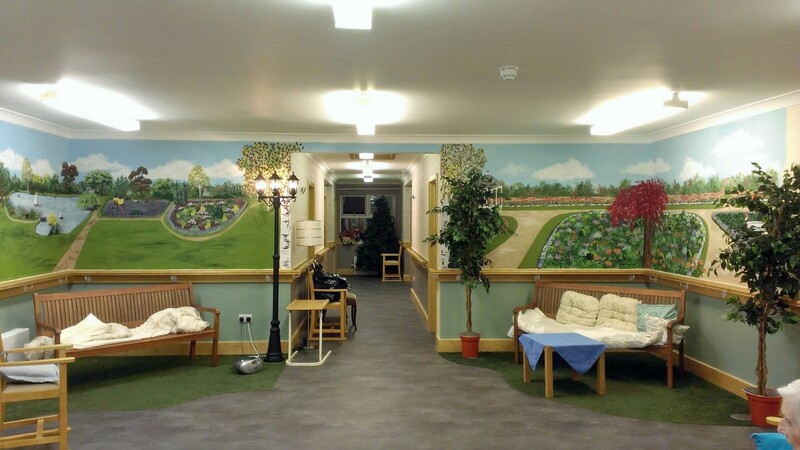 Whilst this had worked, the manager and team leader knew that there was still something missing and had even grander plans for the central hub of the dementia floor. Through Charlotte Designs work at a sister unit, Dovecote approached us to make the team leaders vision of creating an outside area, inside a reality. Her vision was to take a bland seating area with magnolia walls and sofas and turn it into somewhere that would stimulate the residents and provide them with a pleasant and enjoyable place to be. The flooring was changed and ‘road’ and ‘grass’ were laid. The sofas were replaced with park benches and Charlotte Designs were tasked with turning blank walls into a park. We came up with a design that the home changed to reflect the wishes of the residents and staff and then a week of painting began. The mural depicts formal gardens, lake, playground, an avenue of trees, walls with wisteria and ivy growing up them and even a working clock. 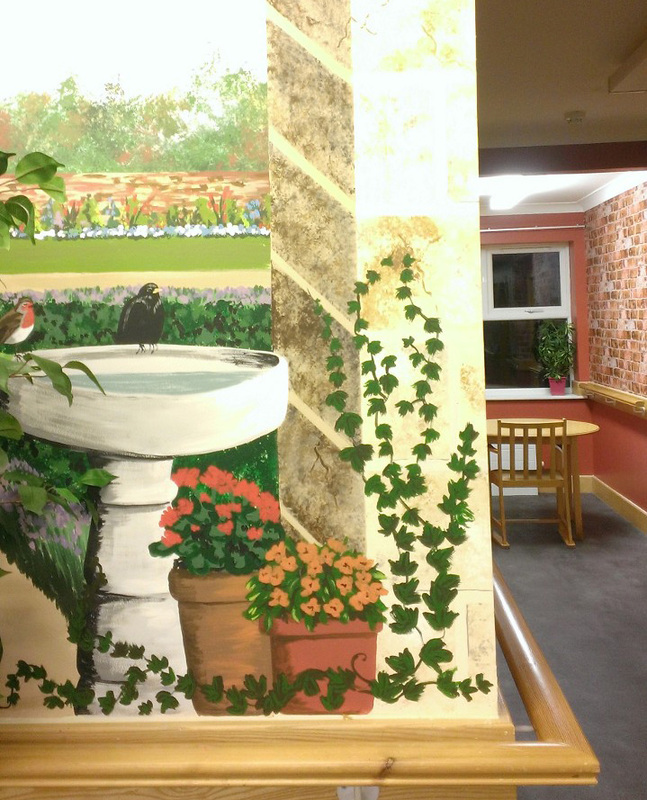 All this was finished off with painted planters, dogs, birds trees, lamp posts and at the request of the residents, a hedgehog. The end result was an amazing transformation. 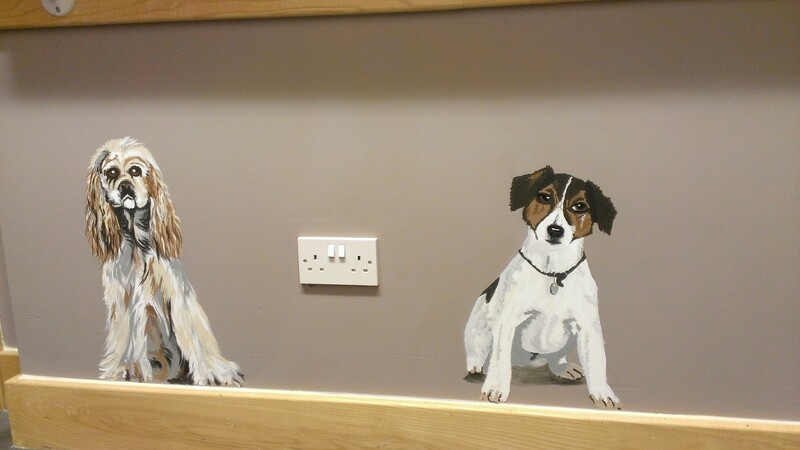 “Your art work is brill and has brightened up the living space for our residents. And made the ideas that were in my head become real. 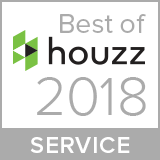 The residents love it, the staff love it and our visitors love it what more could we ask for ! !” Said Team Leader Nicola Jackson. Staff report a big increase in the use of the area, a reduction in aggression and an increase in sociability. A huge testament to the vision of the staff and a great testimonial for murals.